I've been intrigued by eraser stamps lately so I decided to give them a try myself. I thought it could be cute to make a "B" stamp for using as a "return address" of sorts on letters, etc. I tried a few different techniques... some worked and others didn't. Here is what I did: I started by printing out a few "B" that I liked. In this step, I forgot a very important step. 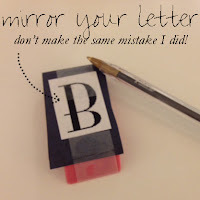 MIRROR YOUR LETTER. You need it to be the reverse so that when you stamp it, it's the correct directions. Lucky for me...a "B" is the same on the top as it is on the bottom so my stamp still turned out ok. Using transfer/carbon paper, I traced the letter onto the eraser. Using an exacto blade, I started to cut out the negative space in and around the letter. I found this to be VERY hard. So I improvised. I carefully cut a small sliver of eraser and left the rest to become my "base". I retraced my "B" (at this point, I STILL didn't notice that it should be flipped) and I cut it out with my exacto. This was a lot easier to do. I then glued my "B" to the other part of the eraser. After letting it dry for a few minutes, I tested it out. This is when I noticed my mistake. Oops. 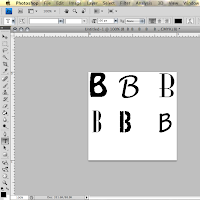 Like I said before, it was lucky for me that a "B" can be flipped around because it's the same on the top and bottom. After completing my "B" I decided I should make a mustache. You never know when that might come in handy. The mustache was so much easier because it didn't have any middle parts to cut out. I simply traced my eraser (for size) and drew half of a mustache. I folded my paper over and cut it out so that it ended up symmetrical. I think they turned out pretty cute for not having any fancy carving tools. 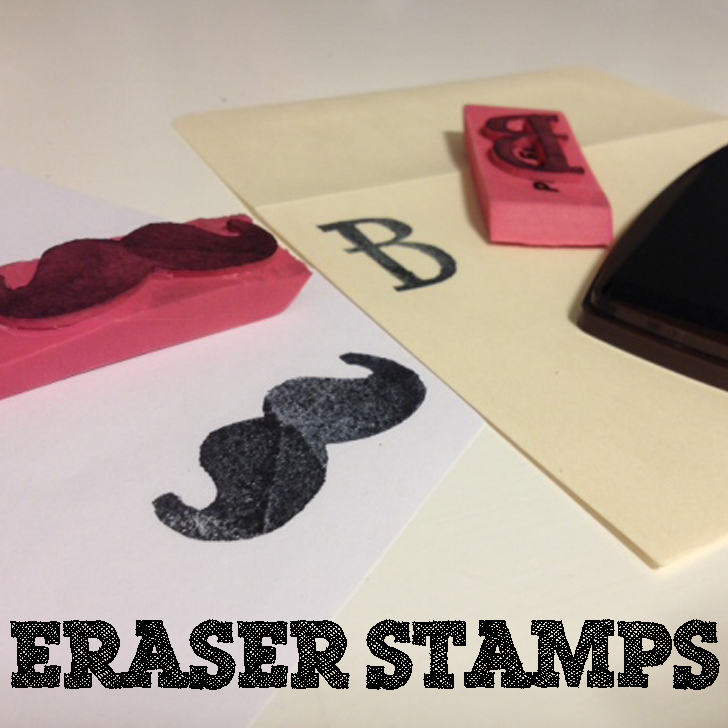 2 erasers + an exacto knife + a few designs = fun new rubber stamps! Thanks for the tip of slicing off one layer, cutting and then glueing back on. That's a good tip! My daughter is going to love this idea! Thanks for sharing! oh good! I'm so glad :) if you make some, I'd love to see how they turn out. Please send me pictures if you try :) I love to see what everyone creates! Super cute! I would do a T, and I think little Christmas trees would look so adorable on oue Christmas card envelopes! Oooh little Christmas trees would be adorable :) Thanks for stopping by! The stamp turned out great. I have trouble, too, with reverse images - it is hard to visualize for me. I've been wanting to make my own stamps for a while. This seems so simple though. I may just have to try. Yours come out great! Cooool! I love this idea! These are too cute! I love that mustache. Awesome job! P.S. I have a giveaway going on right now for some really great hair products (http://www.allonsykimberly.com/2012/11/giveaway-with-flat-iron-experts.html) . Hope you'll stop by! These are a hoot! Especially the mustache! Thanks for linking up to my Pin Me Party! I've pinned this! Have a wonderful Thanksgiving! CONGRATS!!! You have been featured at The DIY Dreamer... From Dream To Reality! Come on over and grab your featured button... you deserve it!! I LOVE THIS!!! Is there a mountain top around that I can go run and scream that from???? Seriously, great job. I could have totally used a tutorial like this last year when I was making a baby book for my nephew. But this might just solve many of my future creative hiccups. Did I say that I love this yet?? Ps do you have a pin for this? Your comments totally made my day. Have a great weekend! Hey, you made MY day!! I got you all pinned up on my pinterest. I am so excited to have it!